Quick and delicious runner-inspired recipes! We all know the benefits protein has in maintaining muscle mass and aiding in muscle recovery post-workout. While a plate of scrambled eggs may be protein-rich, its safe taste can leave you craving something more. An alternative that’s equally quick and easy? Banana-egg pancakes! 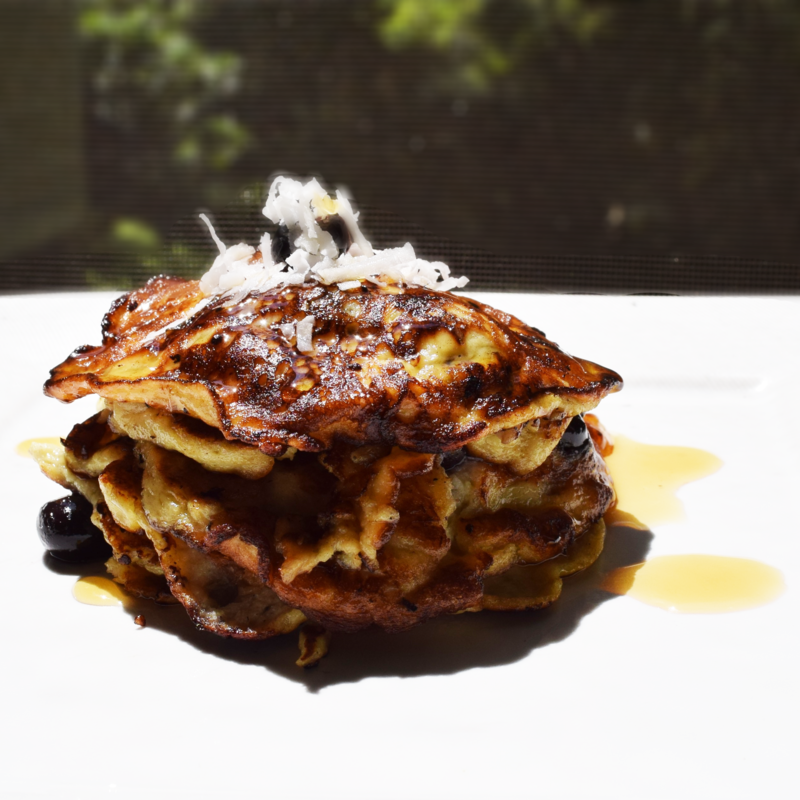 Typically used as a great pancake alternative in gluten-free diets, this tasty dish provides equal parts flavor, protein, and potassium for either pre or post-workout fuel. Mash the bananas until they reach a very smooth consistency (a few small lumps are okay). At this point you can add any flavorings you like. Some of my favorites? Honey, coconut flakes, vanilla extract or peanut butter. If you want to add heavier extras like chocolate chunks, berries or nuts, add once the pancakes are dropped onto the griddle, before the first flip. I’ve found that toppings actually help the pancakes hold together while you flip them! Drop two tablespoons of batter onto a heated non-stick griddle to make a pancake. I use a 1/4 cup measure, filled 2/3 of the way full. Space the pancakes about one inch apart. I like to add a small amount of vegetable oil or butter to ensure the pancakes don’t stick. Cook until the pancakes are just set on the edges, about one to two minutes, and flip very slowly to keep the pancake in tact. Continue cooking and flipping until golden brown on both sides. Once golden brown, remove from heat. Keep the cooked pancakes warm in a stack while you finish the rest of the batter. Serve with any desired toppings. My favorite topping combo: coconut flakes and honey. 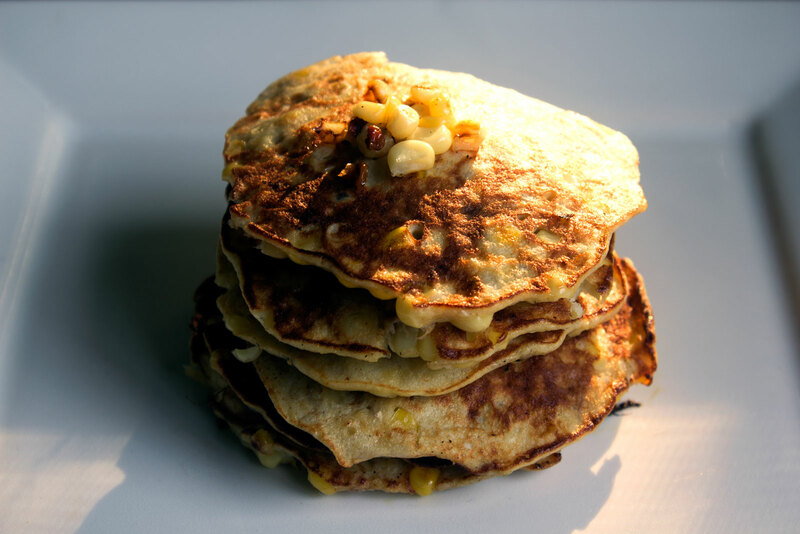 I add fresh corn that’s been sautéed in butter, salt, and a generous amount of black pepper for a take on my grandmother’s corn cakes. These are especially good in the summer as a lighter substitute for corn bread or just as a side to any summer meal. If you like spice, I suggest adding a pinch of cayenne to the batter. Consider the size and ripeness of your bananas when making these pancakes so as not to overwhelm with banana flavor. I go for a smaller, yellow banana with no brown spots.